The word sylvania is from Latin and refers to a forested place. Our business is devoted to working with lands that are in woodlands or lands that are returning to an originally-forested condition. We are professionals dedicated to excellence in forest stewardship for northern woodlands of Wisconsin and Michigan. In this, we work to perpetuate, regenerate, protect and conserve forested lands in an area that extends from Migisy Bluff in western Marquette County, Michigan, to the St. Croix River region of northwest Wisconsin. The geographic region we serve is special and very familiar to us. The area is ecologically unified as part of what is recognized as the Northern Continental Landscape Ecosystem. Our part of this landscape shares common underlying bedrock types; a common glacial history; similar glacial deposits; and similar surficial features. Furthermore, the area is covered by related soils and similar tree species mixes and is influenced by similar climatic and snowfall systems; latitudes; and solar-energy regimes. 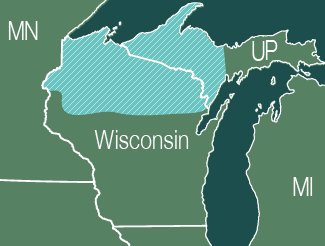 Generally speaking, we work across northern Wisconsin north of State Highway 8 and east of US Highway 53 throughout the western Upper Peninsula of Michigan west of State Highway 41 and north of US Highway 2.